Martyn Dolby won two finals. Martyn Dolby and Chris Ford both completed title doubles at the Northants Bowling Federation indoor finals held at Stamford IBC on Sunday, which followed hat-tricks 12 months ago. Dolby spent most of the day on the green competing in four finals, but in the end had to settle for success in two of them. He won the singles, defeating pairs partner Adam Warrington 21-20 thanks to a treble when trailing 18-20, and he retained the mixed triples crown with Warrington and Ford, defeating Bob and Carol Warters and Roger Martin 19-11. Ford’s other title came in the singles where she defeated the luckless Shirley Suffling (21-13), who had the misfortune to lose all her three finals on the day, the others being the mixed pairs with Derek King against Carol Hunter and Joe Martin (8-15) and in the senior singles where Joan Robinson retained the title with a 21-5 victory. 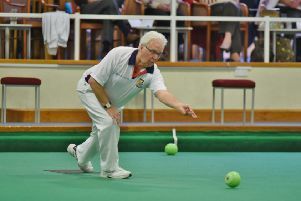 There was consolation for Bob Warters for his defeat in the mixed triples as he toppled defending champion Dolby 21-18 in the veterans singles, although he was made to sweat when his opponent stormed back from 9-20 down with nine shots in three ends. Dolby’s other defeat came in the pairs with Warrington where Nick Wilkie and Joe Randall came from 10-11 down to retain the title with a second half surge, winning 20-12. Randall, though, had to play second fiddle to defending champion Stephen Harris in the under 25 singles (9-21). Harris’s defence of the triples, however, with Cliff Watson and Peter Edwards was thwarted by first-time county winners Michael Humphreys, John Holroyd and Kevin Winter, who won 20-11 after being 0-6 down. The women’s pairs was a rather one-sided affair with Jan Want and Denise Mackie winning 26-5 against youngsters Helen Holroyd and Louise Harris, who will no doubt benefit from the experience. The women’s triples final had been awarded in advance to Fiona Richardson, Margaret Linnell and Julie Masters as two of their opponents would have been unavailable for the national finals had they qualified. All the winners will now represent Northants in the national finals at Newark IBC from April 19-23. Singles: Martyn Dolby bt Adam Warrington 21-20. U25 singles: Stephen Harris bt Joe Randall 21-9. Veterans singles: Bob Warters bt Martyn Dolby 21-18. Pairs: Nick Wilkie & Joe Randall bt Adam Warrington & Martyn Dolby 20-12. Triples: Michael Humphreys, John Holroyd, Kevin Vinter bt Stephen Harris, Cliff Watson, Peter Edwards 20-11. Singles: Chris Ford bt Shirley Suffling 21-13. Senior singles: Joan Robinson bt Shirley Suffling 21-5. Pairs: Jan Want & Denise Mackie bt Helen Holroyd & Louise Harris 26-5. Triples: Fiona Richardson, Margaret Linnell, Julie Masters received a walkover. Pairs: Carol Hunter & Joe Martin bt Shirley Suffling & Derek King 15-8. Triples: Adam Warrington, Chris Ford, Martyn Dolby bt Bob & Carol Warters, Roger Martin 19-11. The Peterborough senior men’s team continue to amass the points in their quest to keep the pressure on defending Cambs League champions and title favourites Cambridge Chesterton A. The city team brushed aside visiting Wisbech 132-35 to collect the maximum 10 points, with the rink of Mick Linnell leading the rout with a 45-2 victory. Les Sharp, John Barker, Terry English, Mick Linnell won 45-2. Terry Corney, Don Paul, Ean Eagle, Ray Keating won 34-10. Mick Fuller, Pete Harvey, Mick Greaves, Rod Maplethorpe won 30-10. Joe Martin, Steve Johnson, Phil Afford, Mick Duell won 23-13. Nicky Brett was in the England team that completed a hat-trick of British Isles titles in Belfast, his rink winning two of their three matches.